All About Chocolate – Chocolates by Leopold, Inc. The Chocolate by Leopold’s dark chocolate is lactose free. The company does, however, manufacture all its chocolates on equipment used for peanuts, tree nuts, milk, eggs, soybeans, and wheat. Its chocolates may contain nuts or nut traces, alcohol, and dairy products. Although no additional sugar is added to the dark chocolate, some of the ingredients for fillings contain sugar, nuts or other ingredients. If you have specific dietary restrictions or questions about our chocolate candy products, please feel free to contact us and we’ll gladly answer your questions to the best of our ability. The most common triggers of food allergies in chocolate products are nuts, cow’s milk, wheat or gluten, soybeans, or corn. Some chemicals found in chocolate may cause side effects such as headaches. The side effects are not due to allergic reactions but sensitivity to these chemicals. Chemicals in chocolate that may cause reactions include caffeine, theobromine, phenylethylamine and tyramine. What is chocolate, and from where does it come? A tropical plant called cacao produces a seed that is processed to create chocolate. 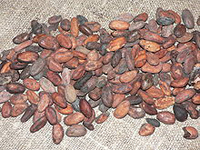 The majority of the world’s cacao beans come from the West African countries of Ghana on the Ivory Coast and Nigeria. Somewhere in history a spelling error resulted in the change from cacao to cocoa, as the beans are known today. In these countries, workers cut the fruit or pods of the cacao tree, open the pods and scoop out the beans. They then allow the beans to ferment and dry before cleaning, roasting and hulling them. After this, they remove the shells; the remains are called “nibs.” Much like coffee, blends of nibs produce various flavors and colors. The next part of the process is grinding the nibs to release the cocoa butter. The heat from grinding causes the mixture of cocoa butter and finely ground nibs to melt and form a free-flowing substance known as chocolate liquor. This chocolate liquor combined with cocoa butter and other ingredients results in the different varieties of chocolate. Because raw unprocessed chocolate is gritty, grainy and unsuitable for eating, Swiss chocolate manufacturer Rudolph Lindt created a process of rolling and kneading chocolate that gives it a smoother and richer quality. This process is called conching. The term ‘conching’ comes from the shell-like shape of the rollers used to knead the chocolate. The longer chocolate (and any ingredients such as milk, vanilla, or extra cocoa butter added to it) is conched, the smoother it feels on your tongue. What kinds of chocolate exist? Adding or removing certain properties from chocolate liquor results in different varieties and flavors of chocolate. Each has its own chemical makeup that produces differences in flavor, reactions to heat and to moisture. This means it is extremely important to pay attention to the type of chocolate for which a recipe calls. What are the white, blotchy areas on my chocolate bar? When your chocolate develops a white, filmy residue, it is called a bloom. 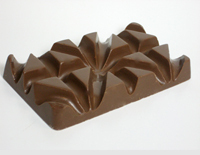 The bloom is the result of cocoa butter separating from the cocoa solids when chocolate is stored in a warm area. If you happen to purchase a chocolate candy bar that has this bloom, don’t let the sales person tell you it hasn’t altered the taste because it has. Choose a dark pantry or cabinet that is around 68-72 ℉. Kept at this temperature and assuming it is not covering fruit or other perishables, chocolate has a shelf life of about a year. Freezing chocolate will result in a greater tendency to bloom. If you have no other option but freezing, let it warm gradually to room temperature before eating or cooking with it. What is lecithin, and why is it in my chocolate? Lecithin is an emulsifier used to reduce the viscosity or improve the flow of chocolate in the manufacturing process. It also helps keep the sugars from crystallizing in milk chocolates. 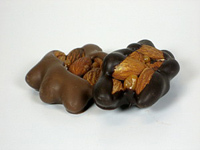 Chocolate — food product made from the fermented and roasted seeds (beans) of the cacao tree. The nib (hulled meat of the bean) is ground and processed into various forms for eating and drinking. For thousands of years, chocolate was a beverage, xocoat. People have eaten it in solid form only since 1847. † Manufacturers may designate chocolate liquor content on their bars. Each manufacturer will produce a variety of bars based on their production methods and market niche. Chocolate by Leopold’s dark chocolate contains about 72% chocolate liquor content. Cocoa Butter — the vegetable fat extracted from pure cacao paste during the process of refining. It is used along with cacao solids to produce chocolate. Some fine chocolate manufacturers are making 60% milk chocolate in which the milk replaces the sugar instead of replacing the chocolate. The main ingredients of milk chocolate are sugar, milk or milk powder, cocoa liquor, cocoa butter, and vanilla. Unsweetened Chocolate – Chocolate that has no other added ingredients. This chocolate is mainly used for baking and contains up to 75% cocoa solids with no added sugar or milk products. Also known as baking chocolate, bitter chocolate or plain chocolate. A few bites of dark chocolate a day and your health will improve—or so the researchers say. Like everything, moderation is key. Treating yourself to one square (a half ounce) of dark chocolate a day provides flavonoids, antioxidants that may clear free radicals, protect against inflammation and protect your heart. Look for dark chocolate that is at least 60 to 70 percent cocoa. Chocolate by Leopold’s dark chocolate is 72% cocoa and lactose free, making it a very healthy treat! Is Dark Chocolate Really Healthy? Of course, eating large amounts of chocolate is still bad for you and may cause weight gain. Taken in smaller quantities, however, dark chocolate might prove to be very beneficial to your health. It depends on the quantity and type of chocolate that you are eating. Numerous studies show the positive effects of chocolate consumption on groups of participants. Check the ingredients label. Be sure that the list includes chocolate liquor and cocoa butter, the two most essential ingredients for fine chocolates. Look for a glossy, shiny appearance, not dull. Search out a smooth, velvety texture on the tongue that denotes a superior chocolate. It should melt easily. Reject a gritty or sandy feel. Check for a slight snap when biting it. A good chocolate would never be soggy or mushy. Since the advent of chocolate, people have given it as a gift to loved ones. It inspires romance and much more. Today chocolates are used for wedding favors, Christmas gifts, Valentine’s Day, birth commemorations, and many more special moments. Discover Chocolates by Leopold gourmet chocolates. Give your loved one a special gift on any occasion or enjoy eating it by yourself or sharing it with a friend.